Data from two insurers found that Volvo’s City Safety auto-braking technology cut claims by 28 percent in Sweden since 2008, the automaker boasted earlier this month. The study by If and Volvia (an insurance entity developed by Volvo and If) examined what would equal 160,000 years spent by cars on the road. According to Volvo, it settles whether such systems as City Safety — offered standard on Volvos in Sweden — are wroth it. “The study of City Safety performance conclusively reveals the real-life value of auto braking collision avoidance systems,” Volvo wrote in a news release. 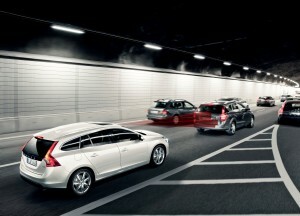 Volvo’s City Safety includes all three of the forward collision prevention systems in today’s automotive market: Driver alerts, braking assistance (which means a driver has to apply less pressure to engage the brakes) and flat-out stopping the car automatically if the driver still doesn’t do so. The study found it reduced both injury — whiplash, for example — and damage claims since 2008. That means less work for collision repairers — and doctors, too, we suppose. Capitalism itself also seems to bear the data out (even in Sweden); insurers are now cutting rates by 20-25 percent in some markets with City Safety, according to Volvo. The 2008 generation of the technology worked up to about 18.6 mph, and the version released in 2013 is good for speeds up to 31 mph. Volvo claims it works for all speeds in the new XC90. The figures from the study show that cars equipped with the first two generations of City Safety (active automatic braking up to 30/50 km/h in certain traffic situations) were involved in 28% fewer accidents and subsequent insurance claims. Volvo has given itself a deadline of 2020 to produce cars in which no one is killed or seriously injured, and it wants to eliminate crashes altogether.